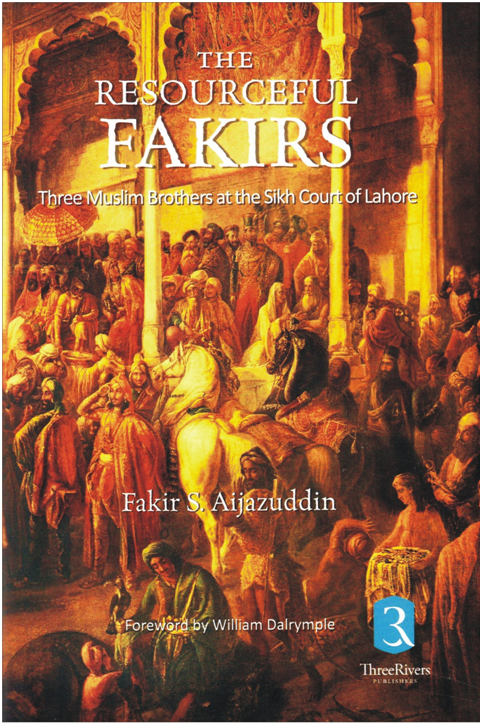 THE RESOURCEFUL FAKIRS – Three Muslim brothers at the Sikh Court of Lahore. The Foreword has been provided by William Dalrymple. Under Maharaja Ranjit Singh, the Punjab was welded for the first and only time in its tumultuous history into a unified kingdom. The Resourceful Fakirs traces the history of this colourful period in an original and intriguing way—through the careers of three Muslim brothers who were courtiers at the Sikh Darbar of Lahore. Fakir Azizuddin served as the Maharaja’s indispensable spokesman and trusted negotiator in all the dealings he had with the neighbours surrounding his expanding kingdom, including the increasingly powerful British. It was a tribute to Azizuddin’s skill that throughout the 30 years of their association, he enjoyed the unalloyed confidence of the canny Maharaja. Fakir Imamuddin held the keys to Govindgarh Fort (near Amritsar) where the fabled Sikh treasury and armoury were located. Their youngest brother Fakir Nuruddin occupied a position of prominence at the court and, after Ranjit Singh’s death in 1839, acted as a member of the Regency Council during the minority of the young Maharaja Duleep Singh. Portraits, engravings, maps, and period photographs visually enhance the text of this historically reliable and eminently readable narrative. The Resourceful Fakirs is a fascinating, original and long overdue study of these three intriguing characters, written by their direct descendant, Fakir Aijazuddin. The Sikh Khalsa as a whole is a much underwritten subject. Although Pakistan has very similar boundaries to the Kingdom of Ranjit Singh, the Sikhs have attracted the attention of far too few Pakistani historians; while Sikh historians have rarely been able to access the voluminous records of Ranjit’s Singh’s court, held in the heart of the Punjab Civil Administration in the Punjab State Archives in Anarkali’s Tomb in central Lahore. Many of the documents used to Aijazuddin to write this book have never been published before, and this book is a substantial contribution to the subject. In addition to creating memorable pen portraits of the three brothers, he gives one of the best sketches in print of life at the heart of Ranjit Singh’s inner circle. To date, Aijazuddin has been known mainly as one of Pakistan’s most eminent art historians. With this volume he has now become, in addition, one of Pakistan’s most interesting historians and biographers. The Resourceful Fakirs is a remarkable achievement.